The visitors of Koh Rong are in a constant state of party, but I’ve heard from long-termers on the island that it hasn’t always been this way. Only five months ago it was quieter, a place more known for smoking weed and relaxing than MDMA-fueled laser light show beach parties (those are commonplace, now). The island is segregated into a Western section and the traditional Khmer village, but the lines are beginning to blur. There are still signs asking the general public to respect the Khmer culture - women should cover up in the village area, ask locals before taking any photographs, etc. But nobody enforces those rules. Most people are respectful, but some aren’t. 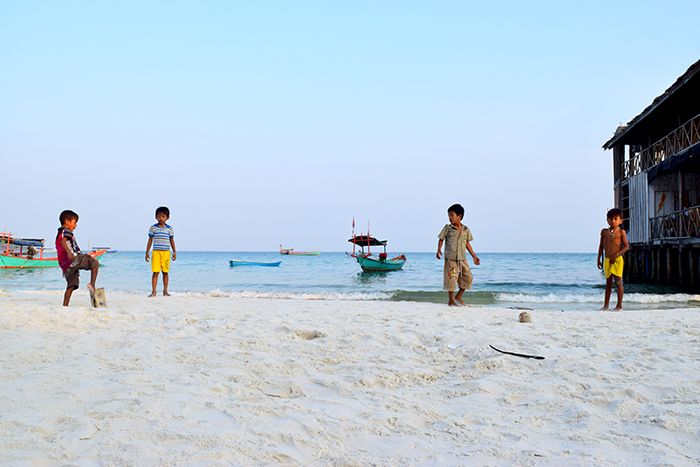 Khmer children are everywhere; they scramble along the beach, play fight and pose for pictures for Westerners. They’re not afraid at all, not even wary. But it’s strange to see little kids playing around tourists smoking joints and taking shots. I imagine how angry people would be about this back in the USA or Australia, how the older generations would put up a fuss. 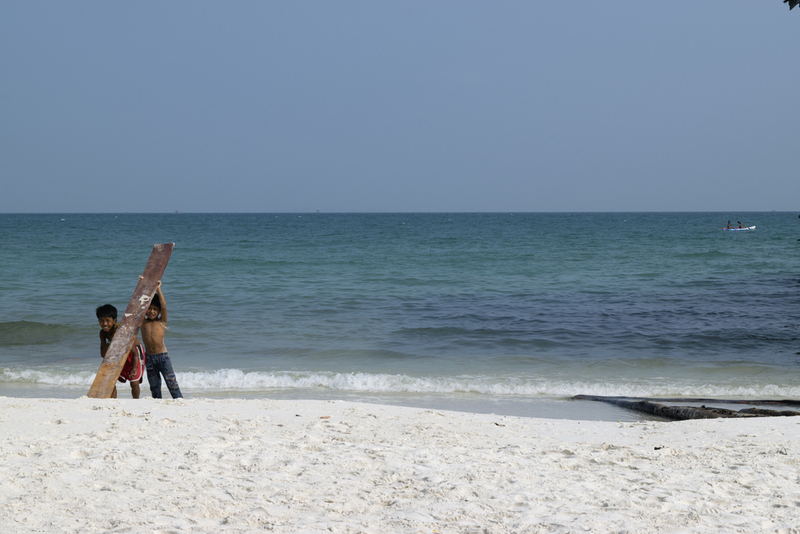 But we’re not there right now, and the people of Koh Rong are deeply invested in the tourism industry. You have to wonder about tension between the Western owned guesthouses and the Khmer owned ones. The Westerners all have deals with each other; the bartender at Island Boys Guesthouse tells you the best breakfast is at Dreamcatcher Inn, the best weed cookies are at Mango Lounge, the chillest vibes are at Vagabonds Bar, the cheapest dinner is at White Rose’s restaurant. It’s like any promotion anyplace. But here it feels sketchy; are the Westerner business owners taking what is rightfully owned by the Khmer, using their land without giving back to the community? If there are people on the island that feel that way, they’re not speaking up. Many Western owned guesthouses have Khmer partners that have helped them build business from the beginning and now keep their water running, their power working. Khmer work for most Western guesthouses as well, cooking and cleaning. The community as a whole is thriving off the tourism industry. There is money to be made everywhere and new bars, guesthouses, and restaurants are popping up on the daily. At the moment, if only for the moment, it seems that most people living on the island, Western and Khmer, are benefitting from the rush of people and business. In a few years, there will be a heavier influx of tourists, and more people means more problems within the population. Many popular Southeast Asian tourism spots have seen this same transformation; the people come in, the area gets dirtier, there isn’t a general infrastructure available to take money and invest it back into the community properly. It’s not good for the people or the place. But try telling any of the hospitality workers of Koh Rong that right now; every time I asked about the future, Khmer and Westerners shrugged it off, acknowledging that it could be problematic but focusing on the present, which is all about constructing and gaining and investing more into the tourism industry. But even if both cultures can agree on a business plan, there are definitely still some underlying social questions. I was recently reminded that even though I’m staying in a community founded on mutual trust and respect (you have to when you’re stranded on an island), there are plenty of people who don’t follow those guidelines. Last night, Island Boys Guesthouse turned two years old and the hostel beside it, Mango Lounge, closed early so the bar staff could help celebrate. Around 2AM, while everyone was busy drinking and dancing and the music was blasting so loud from Island Boys’ speakers that you couldn’t hear a bomb go off next door, someone went through the dorms at Mango, slit every backpack and stole electronics and money. The perpetrator even smashed the locks on the private rooms and rifled through them. This morning several Western staff seethed about the stolen stuff and the Khmer, who “sometimes just don’t get it.” It surprised me how quickly they jumped to that conclusion. It’s logical that whoever stole the goods was someone that lives on the island long term; you just couldn’t get all that stuff back across on the ferry without looking suspicious. You’d have to have your own boat to go out and sell it. But it still could have been a Westerner living on the island. That blind prejudice, that instant belief that it must be a Khmer person who stole those goods, demonstrates a serious underlying social issue. 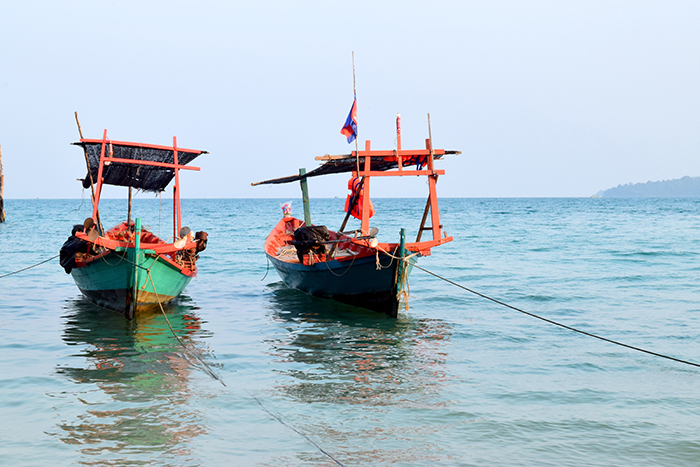 Even though the people of Koh Rong are sharing land and profits, they’re a divided community, and that kind of racial tension is what fuels problems and instability.